Magnificent 2-bedroom/2-bathroom condominium beach vacation rental in resort oceanfront property on Indian Shores Beach on the Gulf of Mexico. Indian Shores is a unique, relaxed gulf coast community located 20 miles west of Tampa between Clearwater and St. Petersburg Beach. Busch Gardens in Tampa Bay is 45 minutes and Orlando Theme Parks (Disney World, Sea World, Universal Studios, MGM, Epcott Center) 90 minutes. Surrounded by warm, gentle surf and plenty to do... or do nothing but savor the relaxed atmosphere and walk barefoot on the beautiful soft, white sandy beach right outside your door. Our meticulously-maintained heated pool offers sun, shade, and great place for a poolside barbecue or picnic. A cool paver deck surrounds the building and leads right out onto our white, sandy beach. There is a warm tropical atmosphere, with plenty of lounges and tables with chairs and umbrellas for guests to gather, read a book, play a game and enjoy the soft sound of the surf as it washes the gulf coastline. There are spectacular sunsets over the horizon from our beach and we regularly see dolphins traveling the gulf coastline. Our spacious, 1100 sq. ft. 2-bedroom/2-bathroom luxury condo is completely equipped with all amenities. We are continuously updating our condo and just recently installed a brand new air conditioning/heating system, painted the entire interior and we also now offer Free High Speed Internet Access. The living room and master bedroom were both recently refurnished, and our entire condo is ceramic tiled. We offer Cable TV in all rooms, DVD, VCR and FREE HIGH SPEED INTERNET ACCESS. Our fully-equipped kitchen has everything you need to cook a gourmet meal for your family. Our breakfast counter located between the kitchen and dining area provides additional seating for five so up to 11 people can dine in comfort. The living room has new comfortable furniture, with plenty of room for the entire family to gather to watch a movie, talk about their day, or just spend some quiet time together. Sliding glass doors lead out to our private balcony with patio furniture and a view of Tiki Gardens, a park across the street and also beautiful sunrises towards the intracoastal waterway. The master bedroom has all new furniture, including a queen-sized pillow-top mattress bed, 27” TV and private full bath. The second bedroom has two double beds, TV and separate full bath. Assigned, reserved parking space in our under-the-building parking garage protects your vehicle from heating up in the hot Florida sun. The onsite building management with full time maintenance staff highly maintains both the building and individual units. Easy access to all central Florida world-famous attractions. Walk to minimarket, great restaurants, shops and entertainment. Enjoy beachside volleyball, swimming, sunning, snorkeling, shelling, fishing, boogie boarding, parasailing, jet skiing, scuba diving and body surfing. Dinner cruises, deep sea fishing, dolphin watching cruises, casino cruises, jet ski rentals, and parasailing are just minutes away. Take a cruise over to Shell Island and you can walk around on this deserted island surrounded by the beautiful gulf waters, collecting sea shells and other ocean treasures as souvenirs of your memorable Florida dream vacation. Nearby Activities include fishing, water skiing, boating, snorkeling, scuba diving, para-sailing, jet-skiing and the packed sand is great for jogging or walking on the beach. John's Pass Historic Fishing Village and Boardwalk is Pinellas County's #1 tourist attraction and is located 10 minutes south on Gulf Blvd. This quaint turn-of-the-century fishing pier features more than 100 unique shops, inviting eateries, and an 1,100-foot long pier. Suncoast Seabird Sanctuary located right in Indian Shores is a nonprofit organization and largest wild bird hospital and rehabilitation center in the United States. Open 365 days/year; free admission. Tiki Gardens, located right across the street on Gulf Blvd, offers nature and equestrian trails, fishing, canoeing, observation tower, pier, and umbrella/cabana rental. John's Adventure Island, a 30-acre water park offers water-drenched fun in the sun featuring the combination of high-speed thrills and tropical, tranquil surroundings for groups of all ages. In a soothing Key West atmosphere, experience an unrivaled blend of corkscrews, water falls, a wave pool, children's water playground and other attractions such as outdoor cafes, picnic and sunbathing areas, gift shops, a championship white-sand volleyball complex. Orlando with its theme parks is approximately 1.5 hours drive. Busch Garden, Ybor City in Tampa and the bay areas attractions are all within an hour's drive. Clearwater Attractions (less than 15 minutes) Clearwater Marine Aquarium is a nonprofit working aquarium dedicated to public education, marine research, animal assisted therapy, and the rescue, rehabilitation, and release of sick or injured marine animals. See dolphins, sea otters, sea turtles, stingrays, and estuaries. Largo Mall Tampa Attractions (less than 45 minutes) Busch Gardens in Tampa Bay is the ultimate family adventure park offering an array of fascinating attractions based on exotic encounters with the African continent. A unique blend of thrilling rides, one of the country's premier zoos featuring more than 2,700 animals, live shows, restaurants, shops and games, Busch Gardens provides real excitement for guests of every age. Lowry Park Zoo features more than 1,600 animals in lush habitats. There are rides, water play area, shows, and restaurants. A new Rhino Reserve opened in March 2005. Florida Aquarium MOSI (Museum of Science and Industry) w/ an IMAX Theater St. Petersburg Attractions (less than 20 minutes away) Florida International Museum Florida Holocaust Museum Salvador Dali Museum Sunken Gardens Derby Lane (Greyhound Racing) State Parks in the surrounding area Orlando Attractions (less than 1? hours away) Walt Disney World EPCOT Center Universal Studios Disney MGM Studios SeaWorld Fantasy of Flight Cypress Gardens Perfect Florida Golf Vacation There are more than 50 public golf courses in the Florida West coast area. 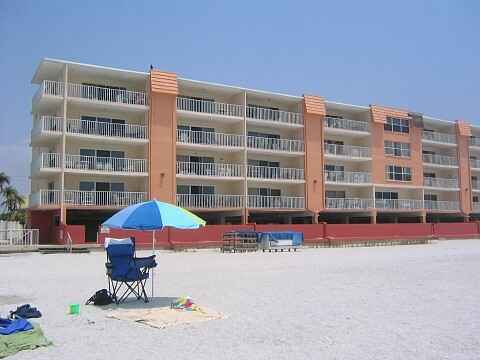 Magnificent 2-bedroom/2-bathroom condominium beach vacation rental in resort oceanfront property on Indian Shores Beach on the Gulf of Mexico. Indian Shores is a unique, relaxed gulf coast community located 20 miles west of Tampa between Clearwater and St. Petersburg Beach. Busch Gardens in Tampa Bay is 45 minutes and Orlando Theme Parks (Disney World, Sea World, Universal Studios, MGM, Epcott Center) 90 minutes. Surrounded by warm, gentle surf and plenty to do... or do nothing but savor the relaxed atmosphere and walk barefoot on the beautiful soft, white sandy beach right outside your door. Our meticulously-maintained heated pool offers sun, shade, and great place for a poolside barbecue or picnic. A cool paver deck surrounds the building and leads right out onto our white, sandy beach. There is a warm tropical atmosphere, with plenty of lounges and tables with chairs and umbrellas for guests to gather, read a book, play a game and enjoy the soft sound of the surf as it washes the gulf coastline. There are spectacular sunsets over the horizon from our beach and we regularly see dolphins traveling the gulf coastline. Our spacious, 1100 sq. ft. 2-bedroom/2-bathroom luxury condo is completely equipped with all amenities. We are continuously updating our condo and just recently installed a brand new air conditioning/heating system, painted the entire interior and we also now offer Free High Speed Internet Access. The living room and master bedroom were both recently refurnished, and our entire condo is ceramic tiled. We offer Cable TV in all rooms, DVD, VCR and FREE HIGH SPEED INTERNET ACCESS. Our fully-equipped kitchen has everything you need to cook a gourmet meal for your family. Our breakfast counter located between the kitchen and dining area provides additional seating for five so up to 11 people can dine in comfort. The living room has new comfortable furniture, with plenty of room for the entire family to gather to watch a movie, talk about their day, or just spend some quiet time together. Sliding glass doors lead out to our private balcony with patio furniture and a view of Tiki Gardens, a park across the street and also beautiful sunrises towards the intracoastal waterway. The master bedroom has all new furniture, including a queen-sized pillow-top mattress bed, 27” TV and private full bath. The second bedroom has two double beds, TV and separate full bath. Assigned, reserved parking space in our under-the-building parking garage protects your vehicle from heating up in the hot Florida sun. The onsite building management with full time maintenance staff highly maintains both the building and individual units. Easy access to all central Florida world-famous attractions. Walk to minimarket, great restaurants, shops and entertainment. Enjoy beachside volleyball, swimming, sunning, snorkeling, shelling, fishing, boogie boarding, parasailing, jet skiing, scuba diving and body surfing. Dinner cruises, deep sea fishing, dolphin watching cruises, casino cruises, jet ski rentals, and parasailing are just minutes away. Take a cruise over to Shell Island and you can walk around on this deserted island surrounded by the beautiful gulf waters, collecting sea shells and other ocean treasures as souvenirs of your memorable Florida dream vacation.